ADDRESS:2035 Gardenbrook Lane, Tallahassee, FL 32301. Off Victory Garden Drive between Park and Apalachee Parkway inside Capital Circle. Eastside. LIVING AREA SIZE & ROOMS: Living Room has a Brick Corner Wood Burning Fireplace, Living/Dining Combo (L-shaped) open to the Kitchen with a Bar. About 1000 Sq. Ft. KITCHEN APPLIANCES: Range, Refrigerator, Microwave, Dishwasher and Disposal. SECURITY DEPOSIT: $950.00. This is not the last month's rent. PARKING: Two + Assigned Parking Spots. 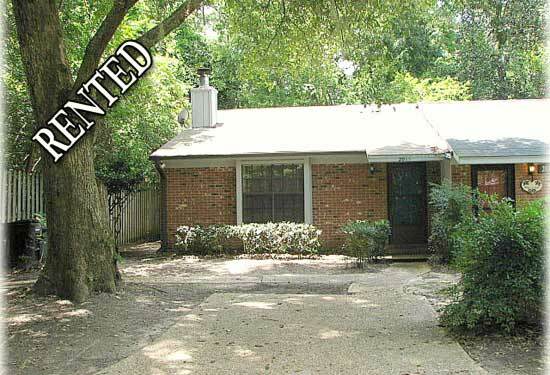 AMENITIES: Tile Floors throughout with New Carpet in both Bedrooms. Ceiling Fans. Window Treatments. Screened Porch. Privacy Fenced Backyard. Two + Parking Spots. In Excellent Condition. Close to Koger, Governor’s Mall and Downtown. Call 850.545-9390 for Appointment to View, Application and Interview.